It is important that you follow these hair care tips so your new hair extensions will last as long as possible. Thank you for purchasing from International Hair Company! We hope you are excited about your new product. Please follow the hair care instructions below to help maintain longevity of your hair extensions. 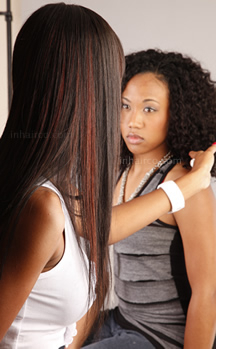 Before Using virgin remy Hair: Thoroughly inspect each piece making sure the color, texture, length and pattern is correct before inserting hair. We gladly accept hair returns only if it is unused and unopened with ties still intact. Washing virgin Hair: Indian Remy Hair should be treated as normal hair and washed regularly to maintain the health and shine of the hair. Shampoo, condition and moisturize your hair every 5-7 days. Make sure to brush out all tangles before you wash your hair or go to sleep at night. Always use a low PH high moisturizing shampoo and conditioner. Hair extensions do not receive a benefit from your natural scalp oil, so it's important to use a leave in conditioner after washing. Dying Hair: To avoid frizz never rub your hair with a towel, that can make frizz worse, instead you should pat your hair dry. It's always best to let your hair air dry but if you need to use a blow dryer only half way(semi damp) dry it and let it finish by air drying. •	Use a soft bristle brush starting from the bottom, gently work your way up. Do not tug or pull on the hair. •	At night, tie your hair up gently or wrap it to prevent tangling. •	If you have braid extensions, run your fingers through the braids to help prevent tangling. Recommended Hair Products: Get the full benefits of your Indian hair by using high quality products. Taking care of your hair is an important part of maintaining longevity and shine. Below are some recommended products that keep hair soft and manageable. Redken All Soft, Pureology Hair Care, Mizani Moisturfusion Milk Bath and Inflúance Hydrating Shampoo and Conditioner. We do not recommend Kera Care, Mane N tail, Wen, Cream of Nature or any natural sodium lauryl sulfate free shampoo or specialty shampoo. ***DO NOT PUSH CUT OR NEEDLE THROUGH HAND-TIED WEFTS*** This will jeopardize the integrity of the hair causing tangling and shedding. The wefts come in pieces and are flexible and can be folded to desired length then sewn in.